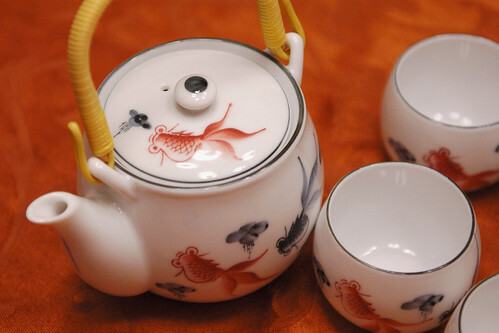 I am hosting our ladies' book club discussion tonight, and since Chinese New Year is just around the corner, I am serving tea in my cute Chinese tea set. I figure the tea will be a nice compliment to the decadent Rum cake I made yesterday. 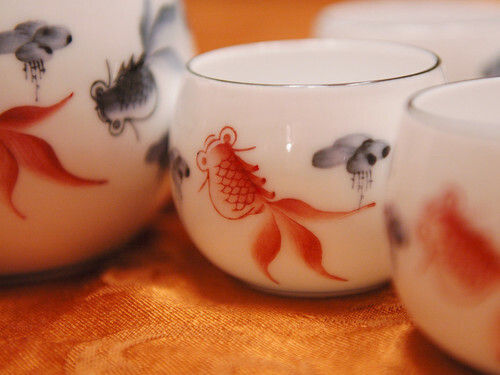 I love the cute koi painted on the cups - they were the reason I purchased this particular set. The sad thing? I purchased the set in China 2 1/2 years ago, and tonight will be its first use. I guess we need to take more time out to steep tea and enjoy it with our friends and family. That's a beautiful tea set!